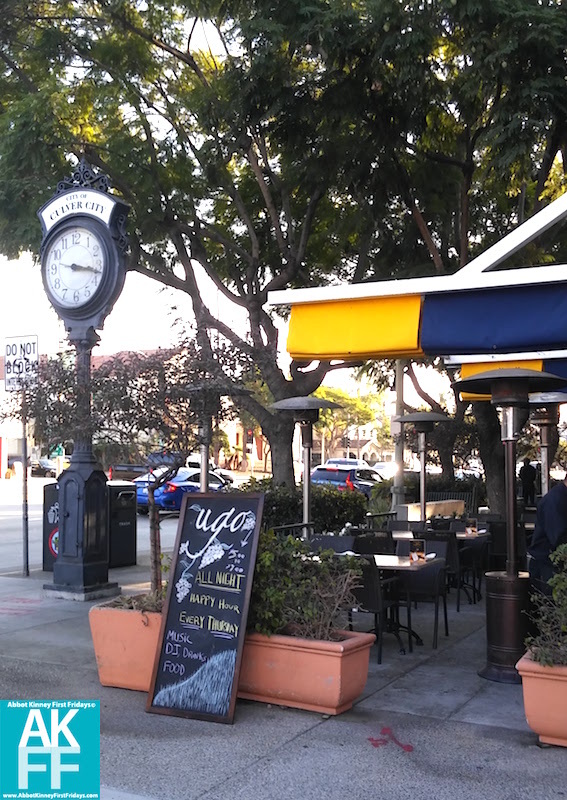 If you find yourself in the heart of downtown Culver City, you might be overwhelmed by the amount of fine dining choices at the tip of your fingers. 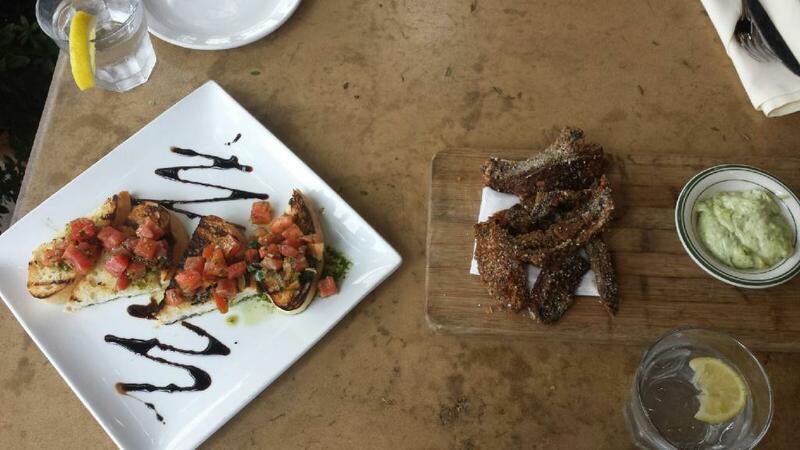 One restaurant you will definitely want to experience is Ugo the Italian café. We started with bruschetta, a classic Italian bread toasted just to a charr, covered in a generous serving of diced, fresh tomato and lathered with an artistic drizzle of olive oil as well as balsamic glaze. This dish has the perfect amount of cloud-like softness and satisfying crunch. Along with this, we ate portobello fries. These are truly a delectable and unique treat for you and your entourage. Mushrooms, cut into thick slabs, are lightly fried and seasoned with Italian spices. They are a healthy alternative to potato fries that leave you craving… more please! For the main course we went for the pasta. Ravioli di spinaci and basil pesto gnocchi are the selections we made and highly praise. While the quantity of ravioli was underwhelming, and no challenge for my stomach’s capacity, the quality was superb. Its covered in rich oil-based sauce that allows the texture and taste of pasta and creamy spinach to shine through as the star flavors dancing on your palette. Their gnocchi, unlike the ravioli, comes in a larger quantity than one palette may be able to handle. This dish is great for the hungriest among us. Rich, potato-based pasta is covered in a hefty pesto cream that gives you a sweet and savory taste. It will leave you stuffed as a Thanksgiving turkey and pleading for a to-go box. As if this was not enough, my companion and I had dessert. Ugo has an amazing selection of sweets that will tempt any palette, from gelato and sorbet, to baked pastry and pie. Decadent chocolate mousses are in abundance so chocoholics beware! We opted for a chocolate hazelnut mousse, which comes in a pod of dark chocolate. When you crack it open, there is one rich spoonful of nutty chocolate cream after another, until you can take no more. Size looks deceivingly petite, until you feel the rich weight of it. This cake is an indulgence fit for a celebration. The food here is fantastic to say the least – to describe our meal at Ugo in one word, gluttony. While sinful, their food is oh so sensational at the same time. Dine here to fulfill your stomach’s deepest cravings, and plan to be relatively sedentary in the hours that follow. 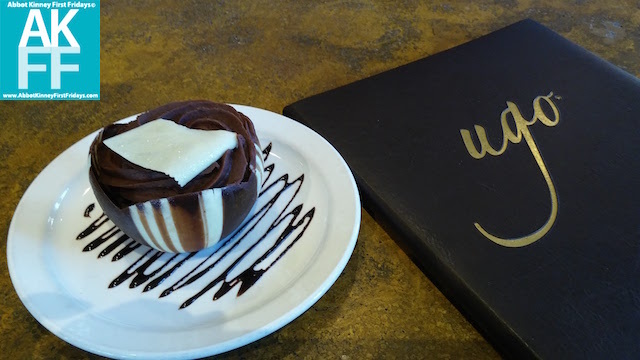 Ugo also has a bakery and cafe, where you can stop in for a delish dessert or coffee – the mocha is a great option for coffee lover’s who also adore chocolate! Happy Hour is every Thursday, all night on food and drinks, plus there’s a dj!